The Lobster Tail Budget At This Hermès Party Must Have Been Insane! There's often one standout feature that keeps guests buzzing about a party long after they've left. Perhaps there was a particularly annoying line to get in. Or a really Instagrammable moment. Or, God willing, a celebrity fight. Seeing as Cardi B head bumps and Solange elevator brawls are divinely inspired events that bless us few and far between, last week's Hermès party took matters into its own hands, drawing up quite a clever way to find itself still a point of conversation days later. 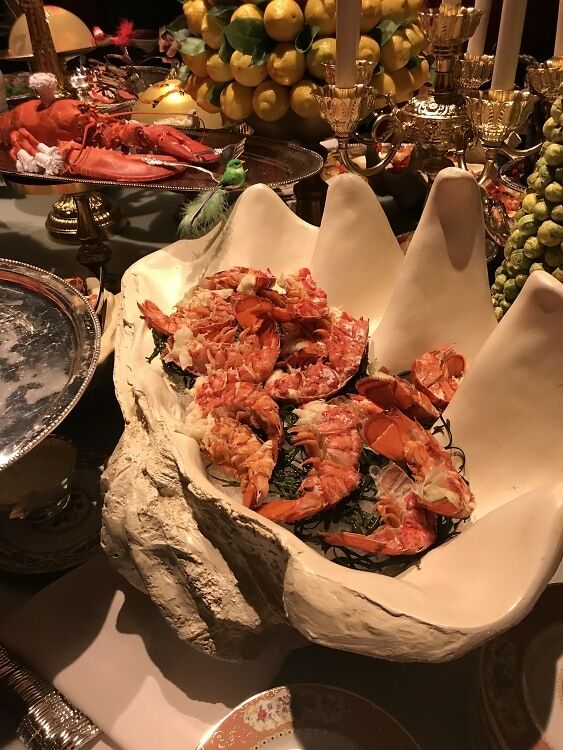 Celebrating the launch of their new Meatpacking District boutique, the high fashion french maison put on a fête not to be missed, transporting guests to a surrealist world that not only invited you in, but assumed you a part of it. Moments after stepping off the elevator, a man rushed up to me, out of breath, just able to get out the words, "Do you play the harp?" A woman sauntered about the party reading a book of poetry aloud the entire evening. 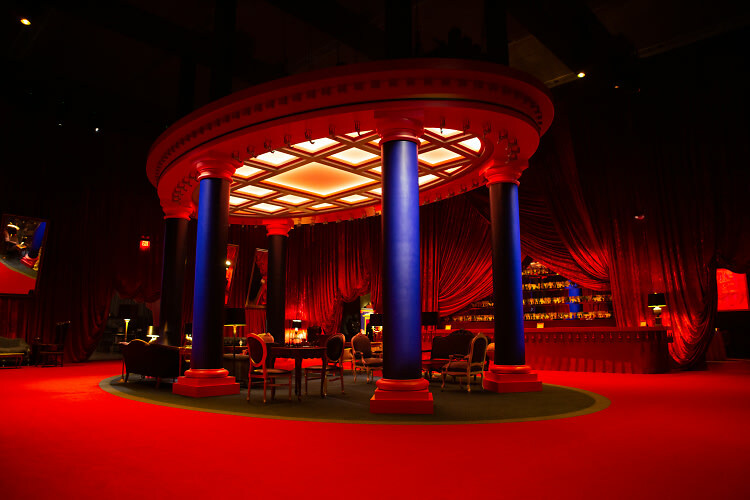 A positively Dada scene erupted throughout the wonderful maze of decadently designed rooms. There was the austere Kitchen where chefs shucked oysters and flipped blinis to top with caviar to the exotic soundtrack of chirping birds. Then came the Tapestry Room, the center of the party with every visible square inch draped in red velvet, followed by the Garden Room, where one had to duck from the forest of thick branches. Each room featuring a stage which hosted a series of acrobatic performances, harp concerts and dance acts throughout the night. One half expected Salvador Dali to emerge out from behind a curtain, one hand stroking his mustache and the other carrying his famous companion, his ocelot Babou. The last room was The Kings Room. A table the length of the hall appeared as if a gourmand mirage, brimming with duck pies, lamb chops, pâté, life sized swans shaped out of artichokes leaves, cheeses, salmon, and giant ceramic shells filled with lobster tails. And just like that, every other detail - the performers, the grand decoration, all of it - was painted but the background noise for this magical feast. "Girl, they've got lobster tails!" a woman yelled across the room to her friend as she walked into the party. "C'est très cher," Dorian Grinspan remarked to a fellow French friend, pointing to a passerby's plate of shellfish. Everyone, and I mean everyone, at that party pushed their way towards the buffet, and walked away balancing a small porcelain plate with a ruby red carcass picked clean. When attending such grand parties, the question of budget is forever an intriguing mystery. How much did they spend, and was it worth the money? At a Goop party, one can only (rightfully) assume that absolutely everything was donated, brands and companies desperate for an association with the Gwyneth industrial complex. At an Ian Schrager party, the majority of the budget goes towards appearance fees for supermodels, allegedly. 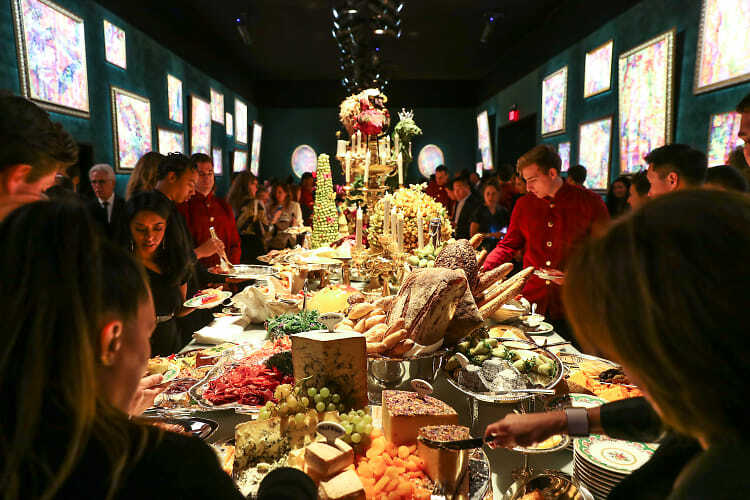 At the Hermès party which was the very definition of lavish and louche and seductive, I looked around, overwhelmed by this oh so convincing ephemeral world, thinking, "this all cost an insane amount of money, but I still bet the lobster budget made the biggest dent." Men who's title for the evening one could only assume was Lobster Butler flanked the ceramic shells replenishing the platters every two or so minutes. Instagrammable moments and celebrity scuffles aside, shellfish is the true way to the heart of metropolitan society. And Hermès, if you're listening, for the next affair, might I suggest adding some claws? Or could the world as we know it not handle such a complete picture? Click through for scenes from the party of the season!